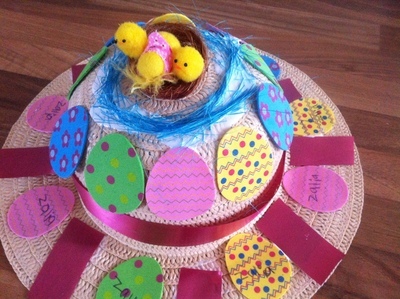 Inspired by our school Easter hat parade, my daughter and I put this together today. This is an easy idea for an Easter bonnet for a girl. Your little one can do all the pasting on their own if they are confident and old enough, or you can help them if needed. It can be a fun bonding exercise if you encourage talking about the design before you get going, and a nice collaborative work. Hat (we picked ours up for $1 at the op shop, you could also get a sparkly plastic one from the dollar shop for a nice affect). Start by removing any trimming that may be on the hat if it doesn't suit your design. 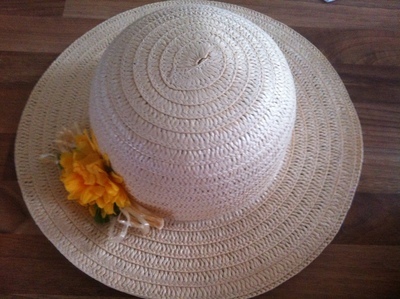 For example, our hat had a yellow flower which we decided not to keep. 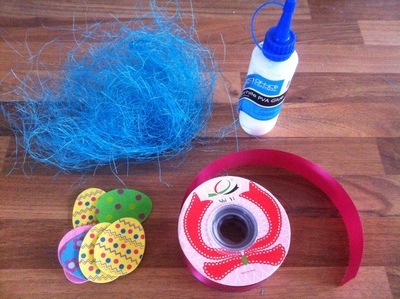 Talk about what sort of a design your child would like with them, showing them the materials you have gathered for them to work with. This is an important step to help them in planning as kids aren't always able to project that they'll have enough materials left for the design they have in mind. Once a design is agreed upon, either let your older child get to work (my 7 year old did this on her own, only needing help to glue the ribbon around the hat), or help them out with it (my 5 year old wanted me to do it and directed me where he wanted things to go). When the creation is complete, put it away in a safe spot, where younger siblings and pets aren't likely to get at it, so the glue can have a chance to dry and everything can fix more permanently to the hat in time for the big parade! Don't forget to take lots of photos at the hat parade. If your school isn't doing one, hold your own at home and judge for creativity!